As I explained in Part I of this series, there are so many unanswered questions and questionable tactics by law enforcement surrounding last October’s Mandalay Bay shooting in Las Vegas. The Paddock acted alone narrative is a laughable conclusion to come to if you look at the facts of the night and further details unearthed by the All Source Intelligence Assessment that briefed Congress on alternative theories and additional avenues to investigate. Let’s dig further into the high likelihood that there was a second shooter on the night of October 1st. The majority of this article is devoted to the erratic and irreconcilable statements and actions by Brian Hodge, who has to be the second shooter and has some kind of connection to Paddock and the attack. I do not have the space to discuss the Deep State / Big Government connections to this false flag attack that is likely designed to be the reason metal detectors are put into all casinos and soon all schools and other public venues with big companies manufacturing those devices profiting mightily from the increase in police state security implementation. Mr. Hodge arrived in Las Vegas on September 30th. Legacy social media analysis tracked Mr. Hodge to Las Vegas that afternoon. He appears to have visited the Bellagio Hotel that evening and checked into his Mandalay Bay room, 32-314, at around 12:15 AM on October 1st. His Twitter activity raises many red flags. Twitter has a geo-location capability and his postings show that he was located in Los Angeles prior to leaving for Las Vegas. Here’s where it gets weird. Hodge’s Twitter account remained inactive until about an hour before the time of the attack on the Route 91 country music festival on the night of October 1st. During the attack, Hodge became active on Twitter again and also used Facebook and Instagram. Analysts remind us that Hodge’s social media usage was likely done to develop a cover to shield him from involvement in the shooting. Hodge became active on Twitter from October 1-2, but his account information was deceptive in nature, according to the assessment. His posts simply do not add up and he appears to be going out of his way to hide something. During the attack, Hodge tweeted out at 10:52 PM that he was “hiding in the bushes.” However, Hodge took the extremely unusual step to disable his geo-location function on his Twitter and had done so since his departure from LA. Disabling this masks a user’s actual location. “This need to disable twitter geo-location is a surveillance avoidance tactic that is taught among various bad actors including domestic and international terrorist groups,” the assessment points out. Was this language a telling mistake made by the unknown second shooter and murderer of Paddock? At the time of that tweet, Paddock was already dead on the hotel room floor, the room where Hodge claimed to be staying. Why would Mr. hodge take the deliberate step to disable his location tracking on Twitter before, during, and after the attack? Needless to say, Hodge needs further investigation as the more I read this report the more I was convinced that he was the killer of Paddock and involved in the shooting to some extent. Hodge is also a prolific user of Facebook and regularly shares what he is doing with his friends on social media. The night of the attack, he was active on Facebook. Here’s another key post that casts a darker shadow on Hodge. 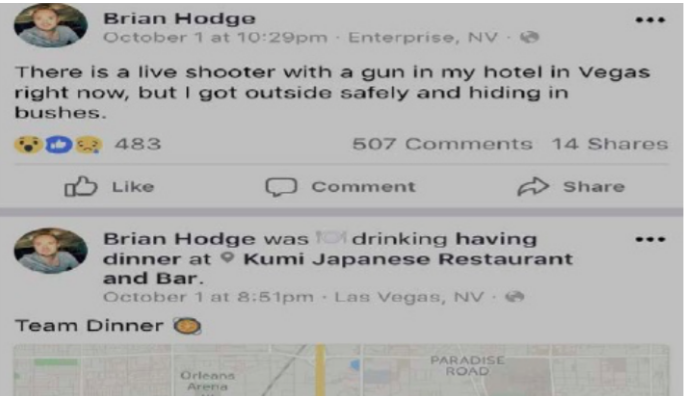 At 8:51 PM on October 1st, just one hour before the shooting started, Mr. Hodge shared a post from the Kumi Japanese restaurant, which is located in the Mandalay Bay hotel. The post reads that he is having a “team dinner,” with Facebook tracking his location as Las Vegas while eating at the restaurant. Was that the team of shooters set to join Paddock later that night? The Facebook post is seen below. 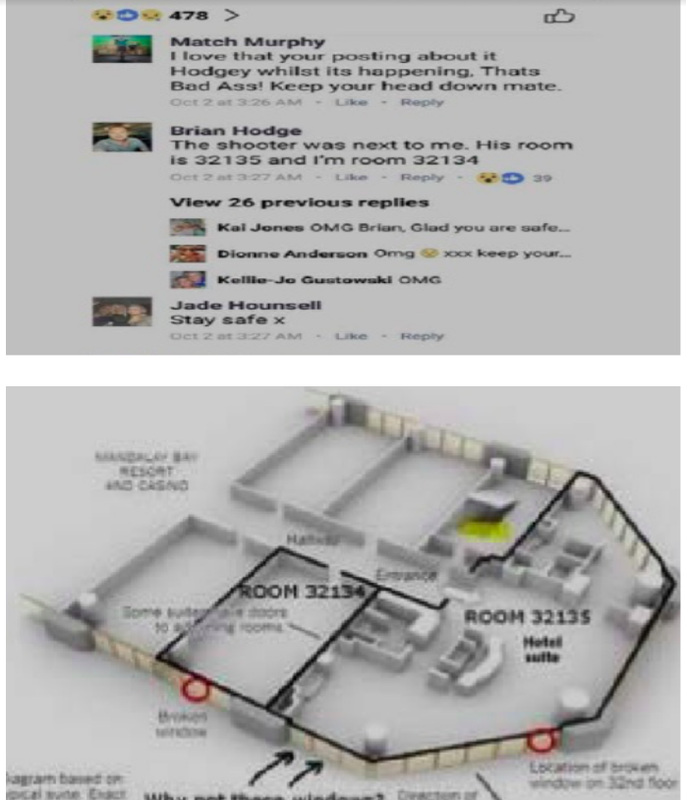 In the Facebook post below, Hodge places himself inside the second room of 32134 that was rented by Paddock. Was this a dyslexic mistake? Or a glaring mistake by a murderous individual? He apparently checked into room 32-314 but said he was in the room next door to a shooter in a Facebook post shown below. The 32-134 suite was the most likely entry and exit point for a possible second shooter to get to the hallway, but Paddock (using a Marilou Danley’s account) rented the room. There were broken windows from both rooms. A graphic of the suite appears below the FB post. 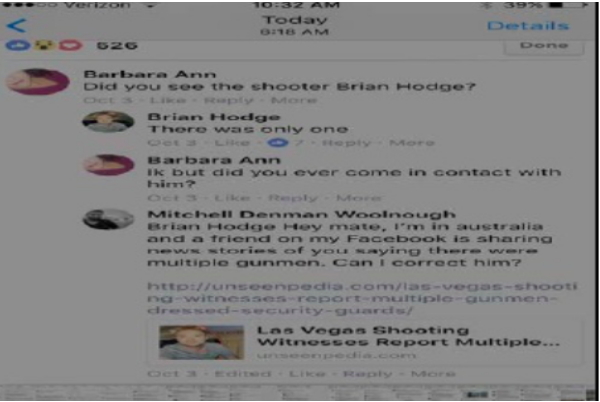 At 10:29 PM, about 14 minutes after the attack was over, Hodge posted on Facebook that there is a “live shooter with a gun in my hotel in Vegas right now, but I got outside safely and hiding in bushes.” What is quite perplexing is the fact that this post tracked Mr. Hodge to Enterprise, Nevada, 8 miles south of Mandalay Bay. How could he be there when he was supposedly hiding in the bushes outside of the casino? Another interesting post by Hodge included him claiming at 1:13 AM that the shooters killed a security guard on his floor. This is a head-scratcher because the security guard did not die, though he was shot. But how would Hodge know only 3 hours after the attack, ahead of the public and most officials, that a security guard had been shot on the 32nd floor if he was outside hiding in the bushes? How else would Hodge know unless he was present during the shooting and assumed the guard was dead after being shot multiple times? Mr. Hodge also has odd and unexplained travel pattern signatures; all merit further investigation. Since the Vegas attack, Hodge has dialed back his social media presence, locking down his Twitter, Facebook, and Instagram accounts. Social media analysis also discovered that Hodge departed the Mandalay Bay area shortly after the attack and traveled to a motel 10 miles north at the Knotty Pine Motel. In an interesting exchange on Facebook on October 3rd, Mr. Hodge ignores a question asked by Barbara Ann, instead directly responding to an unasked question with a “there was only one,” feeding the Paddock lone wolf narrative perpetrated by the LVMPD and FBI. “This is a classic deception indicator,” the assessment points out. Hodge’s travel patterns after the shooting are also suspect. He went from Las Vegas to Albuquerque then back to Vegas on the way home to LA. He remains strangely silent in the few days after the night of October 1st, despite having just escaped the largest mass shooting in American history. In New Mexico, Hodge travelled to Anatolia Doner Kebab House, a restaurant owned by Mehmet Kokangul and Umut Kokangul. Memmet is a Turkish National from Adana, Turkey, which is a known center of Islamic State activity in that part of the country. A discovery from the Knotty Pine Motel records reveal an interesting tidbit that should also spark further investigation. A Mexican National named German Moreno was renting a room there the night Hodge was reportedly there. Mr. Moreno’s car has a license plate tag which points to him being from Guanajuato, Mexico, specifically, the city of Penjamo. This part of Mexico has dealt with Islamic State issues in recent years. The following links are a couple stories and studies to support this claim. There were two other individuals associated with Moreno’s vehicle. Did Hodge meet up with them? Why did Hodge use such a random alibi to explain a three hour time period following the shooting, saying he was hiding in the bushes? Was the team he met with earlier that night at the restaurant and later at the motel a group of ISIS and/or ANTIFA operatives that arrived in Vegas to support the attack that night? Did the security guard’s arrival prompt Paddock and Hodge to initiate the attack sooner than they planned, before reinforcements were to arrive? One statistic worth mentioning is that there were at least 150 Mexicans in the Islamic State of Syria, according to the British Institute of Defense. Here are some more coincidences, inconsistencies, and irreconcilable facts. 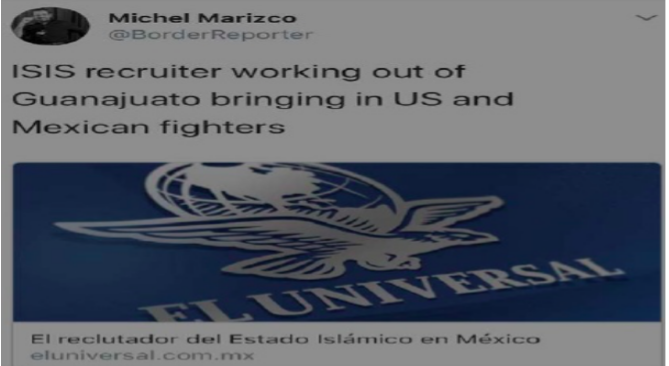 According to the site Publímetro, in September 2015, the Military Intelligence and agents of the Special Prosecutor’s Office for High Impact Crimes of the Attorney General’s Office of the State discovered an Islamic State recruiter in León, Guanajuato. However, he could not be stopped because the spreading of jihadist propaganda is not a crime in Mexico and neither is recruitment. Hodge’s public statements and interviews are also inconsistent and interesting to note. The first of which was to a public relations specialist named Nicole Barlow in Australia, who published an article in an Australian newspaper at 9:30 PM on October 2nd, Australian time, which was 2:30 AM in Vegas. In the article, Hodge claims that he was “staying in a hotel on the outskirts of town while he awaits further instruction” and he was “meant to be in Las Vegas for two weeks.” This does not correspond to other public statements and social media postings Mr. Hodge said during this same time period. And what was he awaiting further instruction on? Did he simply misspeak or did he unintentionally signal his involvement in the attack? Of course, our incompetent and incurious American mainstream media have failed to interview Mr. Hodge, despite his proximity to the single largest mass shooting in our country’s history. Hodge did agree to a few interviews in Australia though and each took place within 24 hours of the attack. He confirmed that he was staying inside the shooter’s suite on the 32nd floor during the time of the attack, departing the floor via the elevator and exiting the hotel through the kitchen, hiding in the bushes for 3.5 hours. He withholds significant information from the interviewers and does not disclose the fact that he has found shelter in a nearby hotel or describe his exposure to weapons firing until prodded by the interviewers. He describes in vivid detail the view from the 32nd floor as the victims were cut down with “sweeping shots” and uses the term “full on” to excitedly to describe the attack. He knows that Mr. Paddock brought a “a specific hammer that is designed to break that glass, double pane or bullet proof or whatever casino glass is made of” in order to shatter the windows of the hotel suite. He made clear to kitchen employees the “need to get us outside the casino” in order to avoid the imminent lockdown of the hotel or to avoid cameras. He states there are “100 odd shots” which is a strange coincidence given the use of 100 round sure-fire magazines. A picture from Mr. Paddock’s room depicts a rifle with this type of 100 round magazine affixed. He expresses concerns about “how to demonstrate we are civilians?” as well as a general fear of getting shot by the police. Hodge also claims that he attempted to return to his room within the first 24 hours after the attack and made it as far as the 32nd floor but had to leave due to the memory of the shooting stating “I was faced with what I………..ya know….what I was faced with last night….ya know the sound of the guns and the fire of the bullets when I was up there” and claims to have allowed the hotel staff and the police go in and gather his belongings on his behalf. He states that immediately after the attack he needed to “stay down, stay hidden” for 3.5 hours. He says, “from the hotel room….some of my team….could see” when describing what the attack was like. Hodge tries to stick to the script and includes very few specifics, only speaking to events on the 32nd floor when pressed to by interviewers. In points during the interviews, he appears to lose track of his story and reveals more than he wishes he did or changes his story somehow. I know a liar when I hear one. Lies always lead to incomprehensible timelines and stories and this is what we are hearing from Hodge. Further details of his travel history in the weeks prior to the Vegas attack also warrant further investigation. According to Facebook, Hodge traveled to Berlin, Paris, London, and back to Berlin two weeks prior to the attacks in Vegas. Ed Klein published some details regarding the FBI’s close monitoring of ANTIFA and its connections with ISIS and Al-Qaeda personnel in Germany. The FBI discovered a “level of chatter” between left wing revolutionary groups and Islamic terrorist groups in the weeks prior to the Vegas shooting. Furthermore, since the attack, Hodge again traveled to Berlin and London in mid-November. 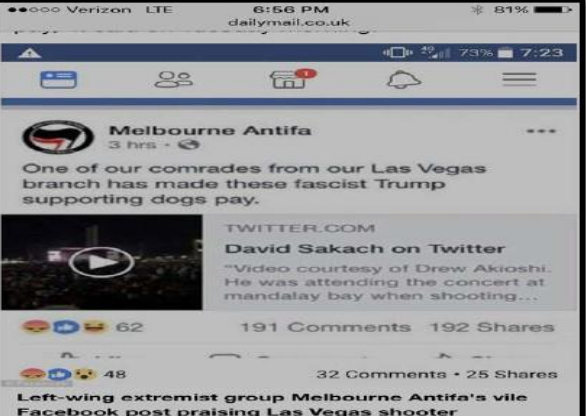 The Berlin travel does not appear to have been publicly acknowledged by Hodge, who also traveled to Australia the next month after that, staying in Melbourne for only a day or two before returning to the U.S. Melbourne’s ANTIFA was one of the first organizations (ISIS did too) claiming credit for the attack in Vegas, stating that they were targeting “fascist Trump supporting dogs.” That post was up for a short period of time before being deleted but you can read it in its entirety below. Hodge is from an area near Melbourne and traveled there in December 2017. Was Hodge politically motivated as it appears Paddock might have been? The Trump factor again rears its ugly head. Trump Derangement Syndrome has prompted leftists to literally lose their minds and lash out in anger and violent hatred. If you wanted to gun down a host of Trump supporters, this country music festival was the place to do it. Marxist/Socialist movements like ANTIFA have become increasingly violent in recent years, especially since Trump has become president. And the Islamic terrorism connection is quite worthy of additional investigation. Islamic compliant religious travel organizations’ contact information was found on Mr. Hodge’s phone. It also appears that Hodge used a safe house at one point, according to the assessment. The political context cannot be ignored when investigating the Las Vegas shooting. The steady rise of violence by leftists has been accelerating at an alarming rate during the Trump era. The connection between ISIS and ANTIFA is a meeting of the mind’s that should concern all of us. Attacks in recent years at the hands of ANTIFA and Black Lives Matter have targeted police, patriots, and conservative politicians. Traffic has been blocked. Protests have shut down parts of town. And police and politicians have been targeted for assassination and killed. A classified FBI memo in July 2017 showed that they were aware of ongoing and increasing collaboration between ANTIFA, ISIS, and multiple Al-Qaeda cells. The connection between Hodge and ANTIFA / ISIS and the association between Hodge and Paddock must be ascertained for this investigation to fully uncover what really happened and the motivation behind the slaughter. However, Hodge’s social media direct messages and other historical data have been wiped. In addition, email addresses have been deleted in classic Crooked Hillary fashion. Hodge has also changed his phone number and physical address since the attack last year. It appears that Paddock procured a massive amount of bullets and weapons and a large enough suite from which to use them all in the belief that there would be a team of ANTIFA or ISIS members to assist in the onslaught of Trump supporters and country music lovers. So there you have it. The inconsistencies, perplexing facts, lack of follow up, and unanswered questions are impossible to ignore any longer. We cannot trust our law enforcement officials to find the truth on their own. They need to be coerced into looking into this Hodge suspect and his connections to Antifa and ISIS so we can get to the bottom of all this. There is simply too much that does not add up. It’s time for us to find the answer before it’s too late and before another massacre happens on American soil.